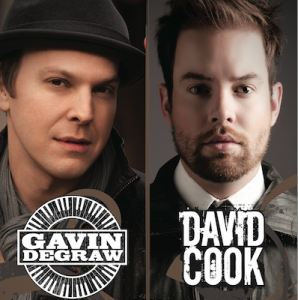 The Homecoming Committee and The Student Programming Association are pleased to announce platinum selling musicians Gavin DeGraw and David Cook with special guest Carolina Liar who will kick off their national tour at Penn State University’s Homecoming concert on October 9th, 2011 in Rec Hall. The show will begin with the Homecoming dance competition at 7 P.M. with the concert to follow. Tickets will be sold on Monday, October 3rd, 2011 in Alumni Hall from 10 A.M. to 2 P.M. Tickets will then be sold on October 4th, 5th, and 6th from 10 A.M to 2 P.M at a table in the HUB while tickets last. Ticket prices are $5 for students with a valid Penn State ID and $15 for the public. Gavin DeGraw will be performing new material off his highly anticipated fourth album SWEETER, out next week on September 20th on RCA Records. Entertainment Weekly describes the first single “Not Over You”, which debuted most added at the Hot AC format, as “a soulful majestic ballad” and People Magazine declares the “hot single” as his “welcome return” to the airwaves. DeGraw first broke through with the 2003 release of his debut album, Chariot, which sold more than 1 million copies, earned platinum certification and yielded three hit singles: “I Don’t Want To Be,” “Follow Through” and the title-track, “Chariot.” DeGraw’s self-titled second album debuted at No. 1 on the digital sales chart and at No. 7 on Billboard’s Top 200 album chart in 2008, earning DeGraw his first Top 10 album. It spawned the hit singles “In Love With A Girl,” and the gold-certified “We Belong Together.” In 2009, DeGraw released Free as a gift to his die-hard fans clamoring for recorded versions of his live favorites. DeGraw recently toured with Maroon 5 and TRAIN that wrapped at the end of August. He has performed and is scheduled to perform on numerous TV shows in support of his new album including The Tonight Show with Jay Leno, Live with Regis and Kelly, The Today Show, Jimmy Kimmel Live and more. David Cook is touring in support of his most recent release This Loud Morning (19 Recordings / RCA Records), which came out on June 28th. The first single “The Last Goodbye” was met by rave reviews and Cook’s second single “Fade Into Me” will be released to coincide with the tour. After winning the Idol crown in season 7, Cook went on to sell over 1 million copies of his self-titled debut album and set out on a yearlong nationwide tour in support of his multiple hit singles. Released on November 18th, 2008, David Cook (19 Recordings / RCA Records) entered the Billboard charts at #3 and the digital album charts at #1, marking the best debut from an American Idol winner since 2006. Collectively the songs from David Cook have sold over 2 million tracks and ringtones combined. Cook’s coronation single, “The Time of My Life” was certified platinum and is not only the biggest single debut but the highest selling coronation single in the show’s history.